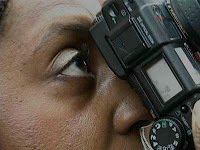 In 2006, Photographer Lauri Lyons made photography history by becoming the first African-American female photographer to be represented by the prestigious stock photography agency, Getty Images. In the Dec 12, 2008 blackweb2.0 interview with Lauri Lyons, the photographer stated that she herself was surprised that she was the first black female on the Getty roster. Honestly, I was shocked myself but as I now think about it… nope, I’m not shocked. The lack of diversity within professional photography institutions is the reason why I started and am dedicated to writing this blog. And I firmly believe that only when the imagemakers are diverse can there be diversity in the way people (of color) are represented in the media and in history. Without diversity in photography, we don’t get the full picture. As Lauri states in the interview, “Generally speaking, the more conceptual or more well known the photographer is, the more expensive the image costs.” So if those little to unknown photographers can’t monetize their skills/images and there’s no cultural diversity among those that can – most of what we do see if simply superficial. The Current documentary also shows Lauri’s work as a teacher at ICP (International Center of Photography) where she works with kids on black & white photography, darkroom print development, editing and presentation. It’s great to see Lauri mentoring young photographers, a practice that I think should be a part of every photographer’s life/professional experience. So I’m not surprised that it took me 2 years to find out about Lauri’s achievement, but now I’m wondering: who was the first male photographer signed to Getty? I’m on the hunt! Just for fun: Check out Lauri Lyon’s Flag International photo project which explores the how the USA is perceived abroad. Then see young America’s introspective POV with these portraits by Sheila Pee Bright.